And just this morning, I was thinking about how pleasurable it is to see bluebonnets mixed with Indian paintbrush: blue and orange. That reminded me that the flower known as Scarlet Pimpernel comes in both blue and orange. Maybe Nature just loves that combination, and produces it whenever she can. They are such pretty birds. Great image, Mike. I love that and recall from your postings that you enjoy painting bluebirds in watercolor. The Bluebirds in the South Carolina Lowcountry could almost be another species. The blue is so vivid you can easily mistake them for Indigo Buntings. I think I took a quick snap shot recently. Perhaps I will post it, even if the quality is poor. I think that “my” bluebird is probably a female and females have more subdued colors than the males. I know that in some species the colors are brighter during breeding season, but I am not sure if that is the case for bluebirds. Finally, I suspect in certain kinds of lighting the blue is more vivid. 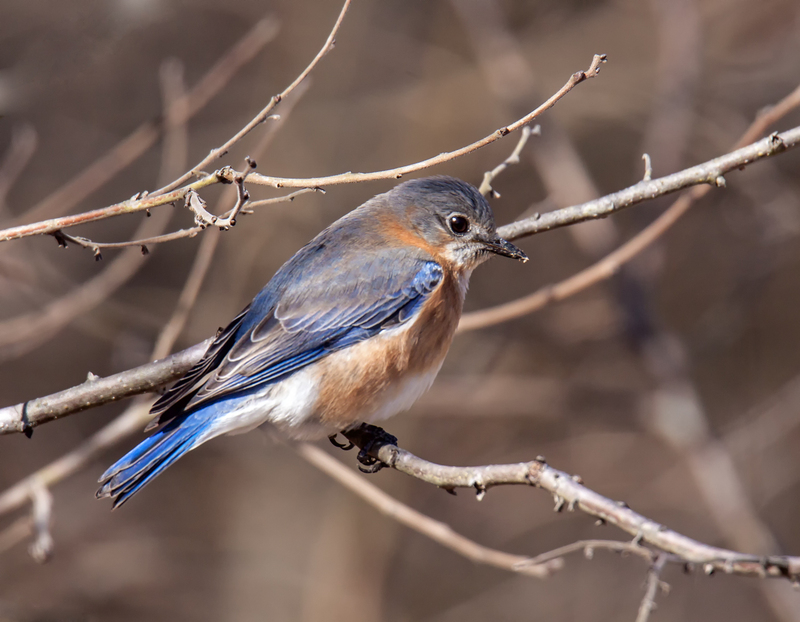 I just posted a rather poor Bluebird image, but the color is true to what we have year round. They’re a beautiful bird and you’re lucky to have so many of them. Ever since Benjamin’s inquiry, Bluebirds will forever be known as “Orange-Bluebirds” by my family and friends. I am delighted that the name has stuck with you as well! I had completely forgotten Paul McCartney’s song and I have that album. I must listen to the entire song, though I doubt that “I’m an orange-bluebird” would have fit very nicely. Thank-you for brightening my day! You are so welcome, Ellen. People influence each other in ways they often never know. When I post photos or write a blog posting, I never know how or if anyone will respond to it. I really appreciate the fact that you are able to pass on Benjamin’s comments. Kids see the world in ways that are different from adults and I love being able to get some insight into his perceptions.